How many people think that a movie about a guy whose teddy bear comes to life and grows up with him is going to be horrifically stupid? Are you also the same group of people that are naysayers of the cartoon with the family who has a talking dog? Cause all of this stuff is from the same mind. Seth MacFarlane is the creator and voice behind Family Guy and also the man behind this hilarious comedy, Ted. 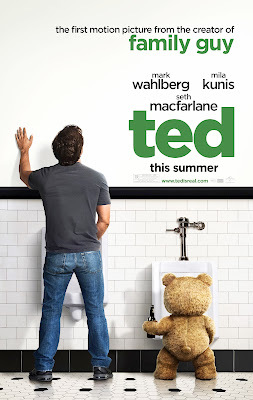 Seth voices the teddy bear and my husband, Mark Wahlberg, plays John - the guy who wished his teddy bear would come to life when he was 8, it happened and now he is the dude with the alive teddy bear. I was skeptical about this movie. It is one thing to have a talking dog in a cartoon, but a talking teddy bear in a movie? How is this supposed to be believable? Well, obviously it wasn't. But it was still awesome. Seth doesn't do things in hopes that you are dumb enough to think them possible. He does things in hopes that you will find them funny...which you will if you have a dope sense of humor like me. There is an actual story which involves one of the other cast members of Family Guy, Mila Kunis. She is John's girlfriend and at 35 thinks that it is time John parted ways from his furry little friend. So that is all going on, while you have Ted being crude, banging chicks, and getting high. Oh, and throw in a bunch of the MacFarlane brand of randomness that we are all used to and you have yourself a pretty legendary flick. Also in this film is Ryan Reynolds. He says nothing, but looks hot as f-ck.